Desc: Custom Sterling Silver/14 karat yellow gold two-tone Mother of Pearl Dressage Pendant. The Mother of Pearl is from Idar-Oberstein, Germany. They are able to paint any color of horse from a photogarph to personalize this gemstone. The two-tone Sterling Silver and 14 karat yellow gold mounting is handmade in the United States of America. The mounting is Sterling Silver and the stars and points are fashioned from 14 karat yellow gold. The pendant has a bright polish finish. 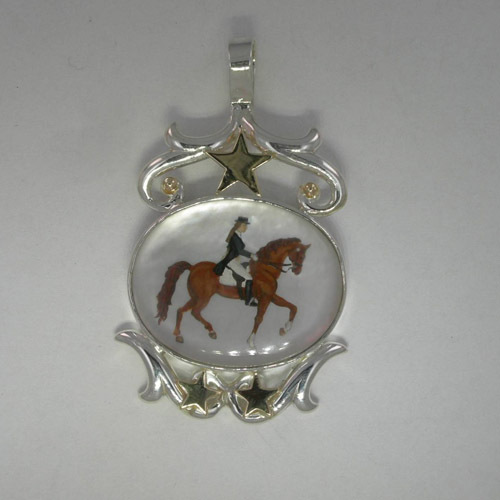 Contact us for details on personalizing a pendant for your horse and rider.